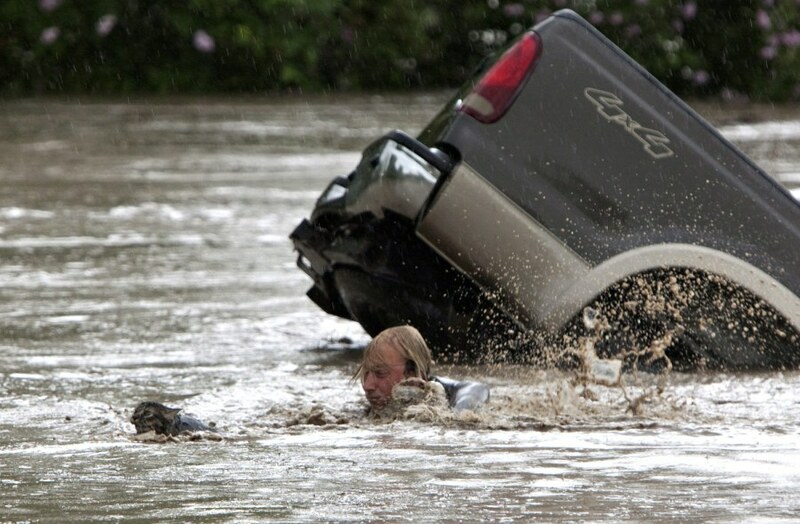 Kevan Yeats crawls out the back window of his partially-submerged truck with his cat Momo in High River, Alberta, Canada, on June 20, 2013, after the Highwood River overflowed its banks. Photographer Jordan Verlage captured a dramatic sequence of photos Thursday as a river in Alberta overflowed its banks, submerging a truck as its driver — and his cat — swam for their lives. Yeats swims after Momo as floodwaters sweep them downstream and submerge the truck. 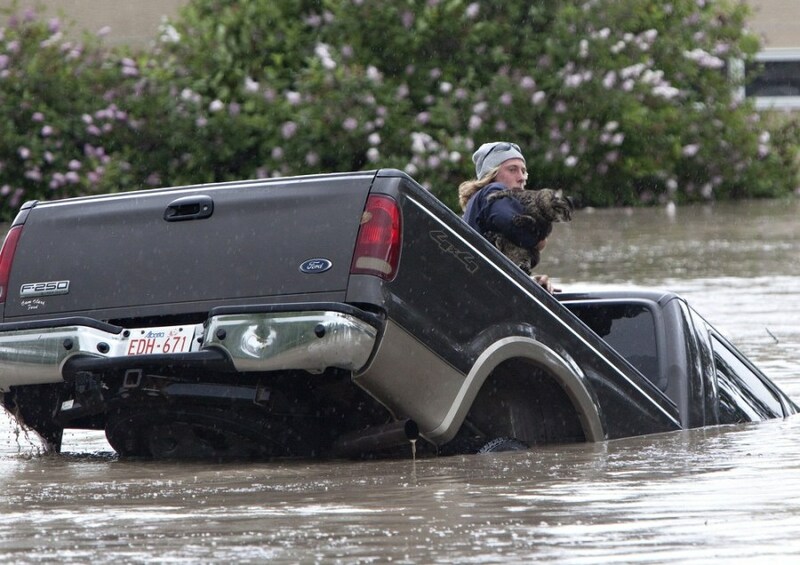 High River resident Kevan Yeats was driving his truck through water on Fifth Avenue. He misjudged how much water was on the road. "The truck started to float away from me and was heading backwards," he said. The front end went under water and he had to break a window on the back of the truck to escape. He was able to pull himself, and his cat, out the truck's back window to safety. He watched as the truck was engulfed in the murky flood waters and he said he doesn't know what happened to it. "As soon as I left the truck, it went under," he said. Yeats and the cat, called Momo, both made it to the safety of a nearby bush where they were rescued by volunteers, Verlage said. Yeats, center, and Momo were led to safety by volunteers after swimming to a bush. As many as 100,000 people could be forced from their homes by heavy flooding which washed out roads, bridges and closed the Trans-Canada Highway. 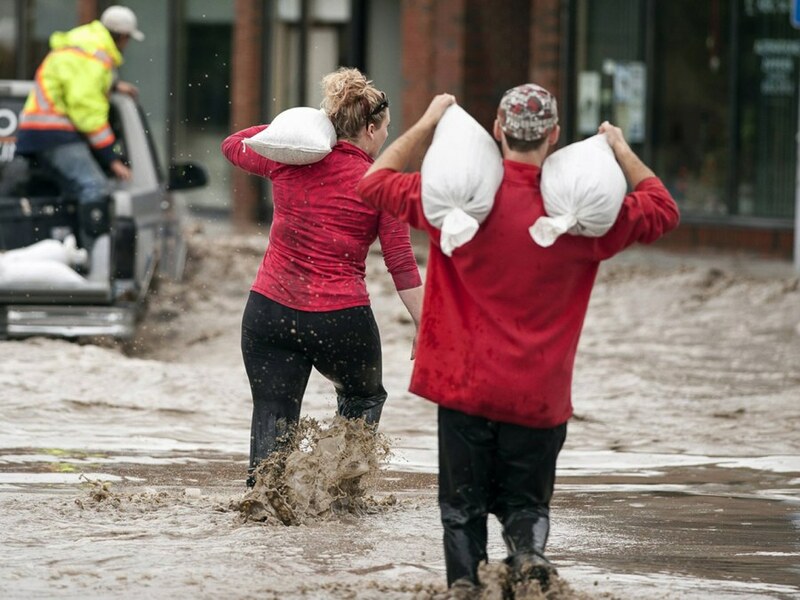 Officials in Calgary say that up to 100,000 thousand people could have to leave their homes because of severe flooding in western Canada. NBCNews.com's Dara Brown reports.